The per watt decline in cost of solar cells has led to unprecedented growth in solar energy generation. While the industry is nowhere near to overtaking fossil fuel energy, the combination of solar and energy storage technology advances has already begun to make solar a highly competitive solution. In fact, utility-scale solar installations deploying grid-level storage are now winning against natural gas power plants in the US Southwest. 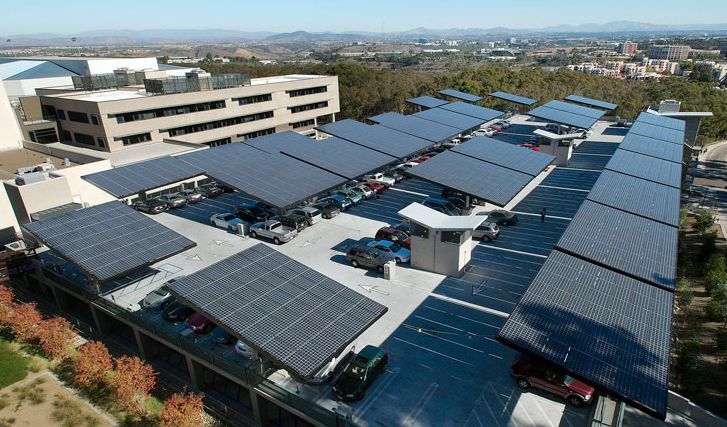 Additionally, large-scale third-party installations such as parking lot solar canopies are springing up in many of the warmer regions. The surge in these installations is prompting a parallel upswing in solar infrastructure, which is seeing its own technology advances as a result of high demand and the need for greater cost efficiencies. 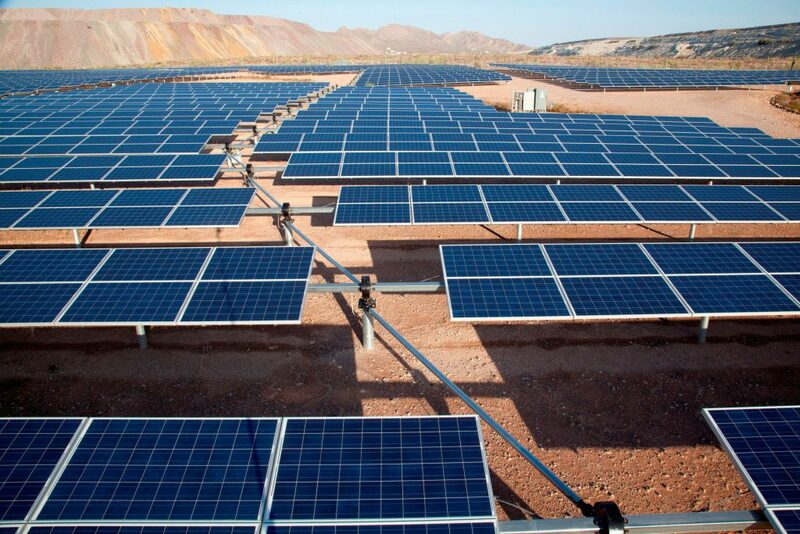 While sturdy racking is important to protect against the ravages of nature, one of the main requirements for large solar farms — and any larger installation — is solar tracking equipment. Solar tracking offers grid operators the opportunity to squeeze efficiency from sunlight at all hours of the day. While fixed-panel arrays are highly efficient for general-purpose energy harvesting, single-axis solar tracking can increase a solar farm’s annual output by roughly 30 percent. Dual axis trackers can add 10-20 percent beyond that. For example, air mass tables for solar panels show that a panel mounted on a tracker can harness as much as 60% of solar intensity in the late afternoon at an angle of 15 degrees, 50% at 10 degrees, and capture 25% at a mere five degrees. In large installations these gains can mean the ability to respond with enough power to satisfy peak demand. A solar tracking system is used for a variety of applications. Depending on the applications, the mounting systems will differ somewhat. 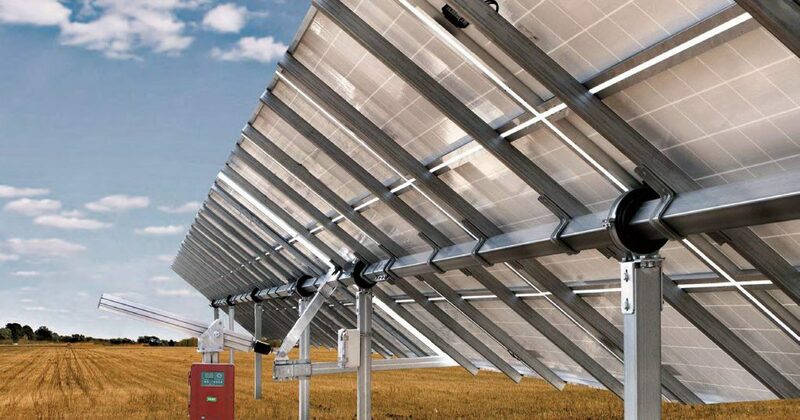 Typically solar trackers hold single or multiple standard flat panels, arranged in rows and funneling power to an energy storage site or directly to a substation. However, solar trackers are critical for large-scale solar installations using concentrated solar power (CSP). These trackers hold mounted mirrors that reflect sunlight to a central collector tower containing hot liquid or gas. 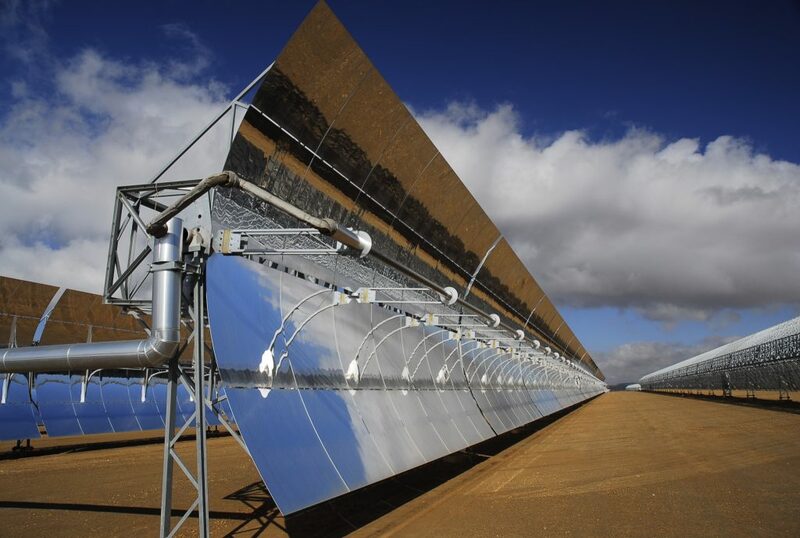 They are also a key element in concentrator photovoltaic (CPV) installations that use parabolic mirrors or lenses to focus sunlight (and even ambient light from the sky) into solar collectors that are part of each unit. These panels and mirrors require precise angles to enable optimized concentration of the light onto a fixed-location tower, into Fresnel lenses, or into a solar thermal collector. The tracking system may be centralized, where a single motor moves many rows of panels at once, or a distributed system, where an individual motor moves one row or table of panels. Solar tracking devices can be classified by the number of axes around which they rotate and by their orientation. Horizontal single axis trackers (HSATs) are horizontal to the ground and mounted on rotating tubes supported by pylons or frames. Horizontal single axis trackers with tilted modules (HTSATs) are similar but installed at an angle, for higher latitudes, but rotate the same way. Vertical single axis tracker (VSAT) panels, also for higher latitudes, rotate around a vertical axis, but the layout must be designed to prevent the rows of panels from casting shade on each other. A hybrid horizontal/vertical tracking system is referred to as a tilted single axis tracker (TSAT). In addition to the panels or mirrors, tracker hardware may include steel posts or rails, cables, junction boxes, slew drives to rotate the panels, and hydraulic dampers to provide flexible resistance against the wind. The structures must be robust, well-anchored, easily transported and installed, and must be able to withstand the elements, including hot or cold locations, strong storms, heavy rain or snowfall, and even seismic activity. For a time, solar tracking for large-scale installations had a reputation as a more expensive and maintenance-intensive technology despite the higher energy capture rates. Some of these reliability perceptions still linger. In actuality, according to Greentech Media, solar tracking systems boast a 99.9 percent uptime rate and advances continue in mechanical functionality and software-based optimization. In fact, the U.S. Energy Information Administration reports that of all utility solar projects constructed in the US in 2016, 79% used solar tracking rather than a fixed panel. Despite being perceived as a less exciting infrastructural component of the solar industry, solar tracking has seen a number of technological and mechanical breakthroughs that promise increased growth due to lower costs and increased weather resistance. One of the challenges is the economics of land use and site preparation. 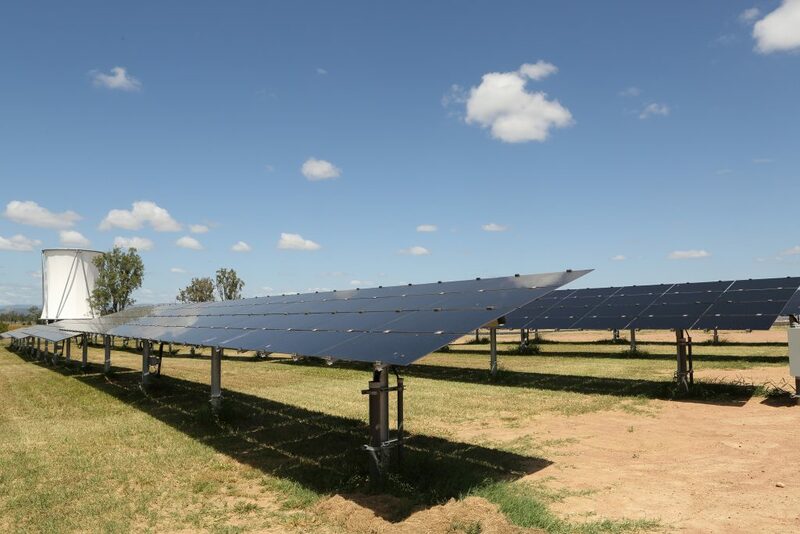 Until recently, utilities and third-party solar farm developers had to plan carefully to ensure that the needed amount of power could be generated from a particular site size given solar tracker configurations (e.g. HSAT vs VSAT). Additionally, they had to take into consideration the site contours and how much grading and preparation would be required to adapt the site to optimized solar tracker deployment. As a result, there has been stiff competition for flat sites. In California, a company called Nevados Engineering is on the verge of launching single axis trackers designed to work on south-facing and sun-facing slopes and varied terrain, which offer better solar exposure. The company’s All Terrain Tracker (ATT) technology uses unique bearings that allow articulation with the driveline so it can fit the terrain using the same kind of posts as on flat land. Every post in the row is used to withstand the slope load, which is the toppling force exerted by the structure being pulled down the hill by gravity. The tracking units can handle slopes of over 20 degrees and can also handle side-to-side, and vertical, post misalignment of up to two feet. The advance vastly reduces the need for grading and landscaping, enabling solar developers to purchase significantly cheaper sloped or contoured terrain to maximize solar energy capture. The company’s software enables developers to predict solar production for a site to calculate the economics. Another recent development, floating ground mounts, has also made more large-scale solar sites available. While most solar trackers are mounted on posts that are driven directly into the ground or less frequently, on posts that use concrete foundations or ballast, certain kinds of terrain won’t support driving posts or invasive concrete structures. These sites, such as capped landfills, can be highly suitable for solar installations due to their height, restricted access, and unsuitability for other uses. The development of floating ground mounts, where the tracker is placed on a gravel pan that can be filled with a variety of materials, has made possible the use of these kinds of sites where posts can’t be driven. Advances in resistive materials also show promise for the solar tracking industry. Posts and other tracking components are typically made of galvanized steel, which means they are coated with a high zinc content layer. Galvanization has been the most weatherproof and anti-corrosive solution to-date, but it still allows rust to form over time. Moisture can be an electrolyte that enables galvanic corrosion to occur, so that as humidity increases, the rate of corrosion increases. Also, atmospheric contaminants can catalyze the chemical reaction. Chlorides in marine environments, as well as and sulfur dioxide and nitrous oxides in industrial locations, may present a higher risk of corrosion. Recently steel companies such as POSCO have begun to add magnesium to the coatings for further protection, a process that had been prohibitively complex until now. POSCO’s PosMAC is a combination of zinc, aluminum and magnesium that “heals” any exposed parts of the steel by forming a layer of simonkolleite, a stable compound, over the vulnerable area. The development promises greater ruggedness and durability for tracking components. Finally, the advent of sensors, drone-based inspections, and the Internet of Things (IoT) will have a growing impact on solar farm operational costs by enabling remote monitoring, hardware predictability, just-in-time replacement and streamlined functioning. An operator in Germany could easily determine when to clean the solar panels in a Dubai installation after a dust storm or know when a tracking mechanism becomes jammed. These advances, coupled with the cost efficiencies of solar and the increasing availability of grid-level energy storage solutions, will continue to boost the utility-scale solar energy market and take market share from fossil fuel power plants. The expansion of solar power offers a significant opportunity for multiple industries, from materials providers to solar panel manufacturers, tracking system component manufacturers, sensor distributors, battery makers, software developers and even drone suppliers. By leveraging the confluence of these technologies each industry can ensure that they participate in the solar market’s return on investment. Tom Breunig is the publisher of Cleantech Concepts, an online magazine and market research firm tracking cleantech R&D and innovative business models.